The same amazing gameplay of the original, with an all new look and feel. 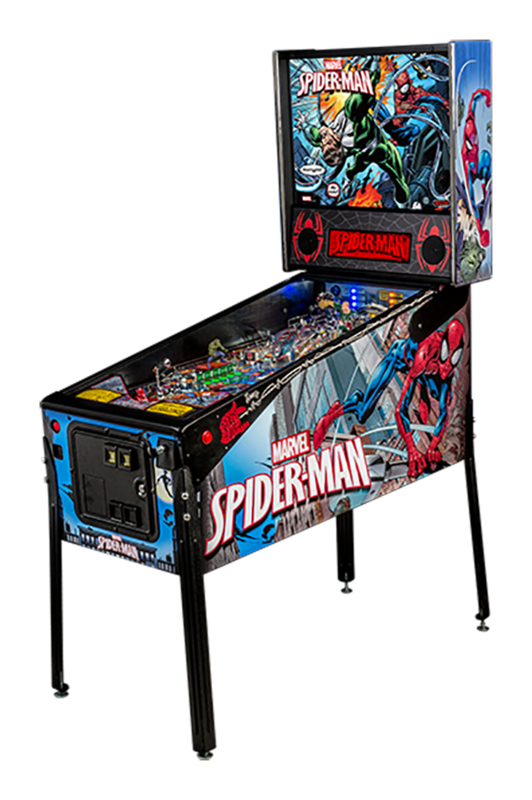 All new art package, including: cabinet, backglass, decals, and playfield plastics are designed based on images from the actual Marvel Ultimate Spider-Man comics library. All new custom-molded toys specifically designed and decorated to capture the Ultimate Spider-Man art style (Doc Ock, Sandman, Venom and Green Goblin). All new animation and dot matrix video art designed around the Ultimate Spider-Man comic art. All new custom speech and sound effects for all characters. New mode event themes based on the Ultimate Spider-Man Universe. Two new music tracks plus the original score. – Steel plastic protectors at the Sandman and in the pop bumper area. – VUK opening playfield protectors at Dock Ock and the Sandman. – Stainless steel playfield protector beneath the webslinger in the pops. – All stainless steel webslinger ball guides. – Optimizations to the design of anti-ball trap plastics and ramp covers. – Improved wire form ramp mounting details. – Anti-wear Dock Ock playfield magnet assembly. – All LED playfield lighting. The Ultimate Spider-Man is a superhero comic book series published by Marvel Comics from 2000 to 2009. The series is a modernized re-imagining of Marvel’s long-running Spider-Man comic book franchise as part of its Ultimate Marvel imprint.